Nikon has announced the arrival of the Nikon 1 J5, the latest J-Series camera that's packing some serious style. The Nikon 1 compact system cameras use a 1-inch sensor around half the size of Micro Four Thirds but still four times larger than the sensor in a typical point and shoot compact camera. They come in three types: the entry-level Nikon 1 S2, the more powerful J-series models, the high-end V3 and the waterproof and shockproof AW1. All use Nikon 1 (CX format) interchangeable lenses (though the AW1 has dedicated waterproof lenses too). It's the J-series that's been updated here, but the new J5 is much more than simple revamp of the old J4. It's had a complete restyle to give it a cute retro look and a lot more hands-on control. 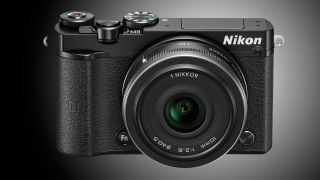 Critics of the Nikon 1 system point to the 1-inch sensor format, which is small compared to those in other compact system cameras, but still offers a major step up in quality compared to regular compact cameras. But this smaller format means the cameras, and the lenses, are small too. Not only that, they bring super-high shooting speeds and a very fast hybrid AF system. The Nikon 1 J5 uses a 1-inch sensor. It's smaller than those in other CSCs, but it allows smaller bodies and smaller lenses too. The new Nikon 1 J5 doesn't just compete with other, larger compact system cameras. Its price and size put it up against high-end compacts too, like the Fuji X30. The Nikon 1 J5 goes on sale on April 30 and will cost £429.99/US$499.95 with the 10-30mm lens, £349.99 body-only in the UK (handy if you're upgrading and you already have lenses) and £559.99/US$749.95 for a twin-lens kit with a 30-110mm zoom.